Francois Guiter, of Elf, is a very calm man, not given to displaying emotion. His company has known Formula One success in the past, with Tyrrell over many years, and, latterly, with Ligier. For all that, he was clearly moved as he returned to the Elf Club des Pilotes shortly after the finish of the French Grand Prix. A brief smile, then a single, quiet, request: "Champagne" ... Victory in France for a French driver, with a French chassis, engine, tyres, fuel. French everything. And the Moet flowed. Throughout the paddock, magnums ejaculated like fire hydrants as delirious Renault mechanics showered each other - and anyone else around - with the stuff. "I am pleased; it has been a long project," M. Guiter had said. Jean-Pierre Jabouille and the turbocharged RS11 had done it. Better yet, they had won fair and square, for this was no inherited victory. Jabouille was the fastest man at Dijon-Prenois from the very beginning of practice, and took a comfortable pole. Less readily anticipated, though, was the presence of Rene Arnoux's sister car on the front row. In the matter of sheer pace around Dijon last weekend, the yellow cars stood alone. Only one man seemed likely to worry them. Gilles Villeneuve, perhaps the most tenacious fighter we have seen in racing for years, qualified his Ferrari third and snatched the lead at the start. The Canadian was at his most inspired as he ran in first place for over half the race, but when the shadowing Renault closed in, even Gilles had no answer, and Jabouille simply powered away. 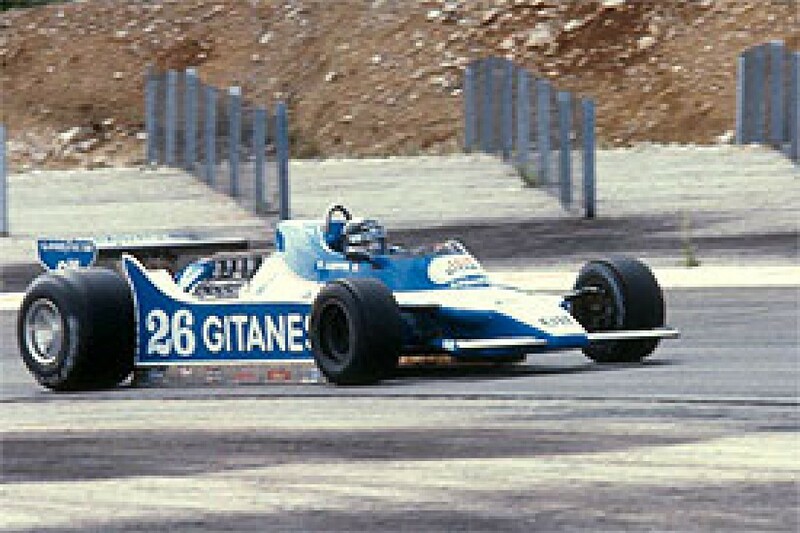 Villeneuve's part in the afternoon was not yet through, however. 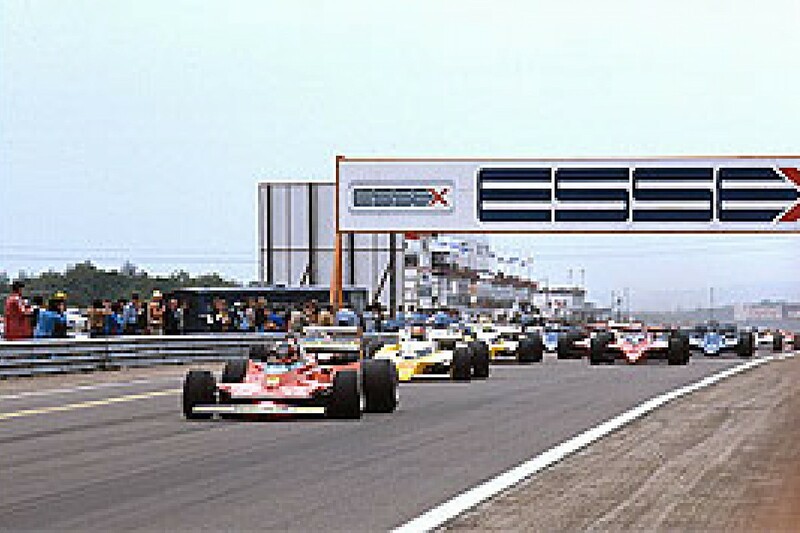 Arnoux, after a bad start, had already picked off such as Lauda, Jarier, Jones and Scheckter, and was closing in, finally taking second place with three laps left. Those closing minutes beggar description. While Jabouille cruised serenely on, there was a battle behind of an intensity not seen for many moons. No one - not even Gilles or Rene - really knows how many times the Ferrari and Renault passed and repassed. It was lurid and exhilarating to watch; and later the two drivers said it had been fun! Only two points were at stake, and one rather hopes that Gilles wins the title by such a margin. It would be a just reward. In the end, he beat Arnoux to the flag by inches. For the rest, there were only supporting roles. After a difficult time in practice, Alan Jones had no troubles on race day, taking fourth for Frank Williams, whose other car was driven to sixth by Clay Regazzoni. Between the Saudia-backed cars was Jean-Pierre Jarier's Tyrrell. Seventh, out of the points, was World Championship leader, Jody Scheckter, who had to stop for new tyres. It was another miserable day for Brabham and Lotus. Lauda and Piquet - or should it be the other way round? - both spun out of the race, the Brazilian when he was running superbly in fourth spot. Andretti's Lotus 80 was beset by a variety of problems, and retired almost unnoticed. And Reutemann's 79 ran out of brakes and into the back of Rosberg's Wolf right at race end. So, new names in the headlines, a weekend when a turbocharged engine showed itself demonstrably quicker, when not a single Cosworth-engined car started from the first three rows, when Michelin dominated the tyre war, when everything came together for France ... or not quite. Perhaps the saddest man in the place was Jacques Laffite, who has so ably led the French onslaught in Formula One this year. In front of his home crowd, there was naught but disillusionment. All weekend, his Ligier simply refused to handle, finishing a distant eighth. It was perhaps a measure of the delight at Renault's success that Jacques jumped out of his car and sprinted over to his victorious brother-in-law to offer felicitations. There wasn't a dry eye in the house. It seems ever more likely that we shall look back on 1979 as some kind of high water mark on the scale of Formula One cornering speeds. Throughout the season, there has been frequent and barely muted protest from many of the drivers about the joys or otherwise' - of the 'ground effects generation'. Cornering speeds have jumped, rather than progressed, over the last couple of years. Bear in mind Niki Lauda's staggering lap at Silverstone recently: more than five seconds clipped in a matter of two years. And at Dijon last weekend, the story was the same. In 1977, Mario Andretti took the pole with 1m12.21s. On Saturday, Jean-Pierre Jabouille boosted round in 1m 07.19s. Impressive, you say. There is, however, more to it than that. Just as there was a feeling at Indianapolis last year that speeds were getting uncomfortably quick, so it is with Grand Prix racing at present. More and more drivers - indeed, nearly all of them - say they want to see the end of 'ground effects'. Forget the criticism (voiced earlier by John Watson and James Hunt) that the cars are too easy to drive, that the designer wins the race rather than the driver, that overtaking is virtually impossible. All that remains valid, as does the spectator's grouse that today's cars make for dull entertainment, with ultra-quick processions the staple diet of the Grand Prix schedule. All that hangs true, but for the moment forget it. The drivers' concern is more immediate than any of it. When the Brabham-Alfa 'fan' car appeared at Anderstorp last year, there was an enormous hue and cry. On safety grounds, insisted the other constructors, the car had to be banned. Fans would otherwise become standard wear, an integral part of every designer's future projects, just like wings. For competitiveness, fans would be necessary, and motor racing traditionally puts safety in the back seat when competitiveness is at stake. The Dijon-Prenois circuit abounds in switchback, left-right up and downhill turns. It is short and quick, and has always been a tiring place, liked by few of the drivers. At the speeds of last weekend, however, it became more than merely hard work. For Jacky Ickx, back in Formula One, practice was a shattering experience. To move from a turbocharged Porsche sports car to one's first ground effects' car - and at Dijon, of all places - took him aback. "I consider I am very fit," he said after the first session, "but the G-forces here are difficult to bear, quite honestly. After five quick laps, I can't hold my head straight ..."
At one stage, indeed, he came into the pits on Friday, his head lolling drunkenly to one side. By the following day, a special structure, into which his Bell Star fitted, had been bolted to the back of the cockpit. Aching muscles, however, are one thing. Potentially far more serious was the effects of the G-forces on the driver's heads. One admitted to being on the verge of black-out a couple of times. Curiously, there were others, like Jody Scheckter, who claimed not to be troubled by the phenomenon, finding the track tiring and boring, but no more than that. Many, though, were seriously perturbed at the thought of 80 consecutive laps in the Grand Prix. The Renault team recently undertook a long term test at Dijon, Jabouille intending to drive the full race distance. At 60 laps he stopped, completely exhausted. Like Ickx and one or two others, he would have a cockpit-mounted neck support for race day. The French team's testing unquestionably paid off. Form the very start of qualifying, the yellow cars were in command. In the opening minutes of the first session, Jabouille whistled round in 1m 7.41s, a full second quicker than he had been in testing, and quite beyond reach of the other cars. On Saturday afternoon, the time was further reduced to 1m 7.19s, and Jean-Pierre was on a very comfortable pole. Virtually as quick was his team-mate, Rene Arnoux, at last having the opportunity to demonstrate his tremendous natural talent. Fastest of all in the second session, Arnoux would almost certainly have improved his time in the last, but his car was sidelined with a broken valve-spring. In the space of five weeks, the two turbocharged cars had hauled themselves up from one end of the grid to the other. Monaco to France. Back to front. "There is no mystery," said a happy Jean Sage on Saturday evening. "Monaco was the first race for us with the twin-turbo system. We had a lot of silly troubles there, and were lucky to qualify. But it was very good for us that the Swedish Grand Prix was cancelled; it gave us time to do everything properly, to complete our third ground effects chassis without rush. We have strengthened the intercooler, which leaked on both cars at Monaco. Now I just hope for a cool day." Jabouille and Arnoux repeatedly sang the praises of the KKK twin-turbo layout. "For one thing, the car is much easier to drive, said Jean-Pierre. "There is very little throttle lag with the twin system. Even more important, the torque is much better. But I think here we are quick because of the car's aerodynamics."" Gilles Villeneuve did not altogether agree with that, although he did concede that the Renaults' mid-range push out of the corners was very impressive. "I think it is their horsepower. Through the speed trap Jabouille is only two or three kph quicker than we are, whereas the Renault is usually way ahead, 10-15kph at Monza, for instance. I think that their power advantage enables them to run more wing than the rest of us, which is why they are so quick in the turns. That's where they are making up the time." Predictably, it was the Canadian Ferrari driver who came closest to disturbing Renault equilibrium. Round and round he went, putting in more laps than anyone, working away, wheels locked . . .
"I think for sure I can go quicker," he said on Friday evening, "but no way can I equal the Renault times. I think it is not possible." Villeneuve's grin is never far away, and it spread across his face now: "There are places here where I still haven't found the limit. Tomorrow I try ..."
Faster than his team leader in all three sessions, Gilles did improve on Saturday, but, as he had thought, the Renaults remained beyond reach. "I hate this bloody place," muttered a morose Jody Scheckter after practice. "There's nothing you can get your teeth into, no way I can get a rhythm going. Seems like everywhere the road is falling away from you. The traffic's bad here, really bad. There are one or two cars in this place that just shouldn't be allowed in Grand Prix racing any more. I wasted qualifying tyres on laps when I got held up. The car's understeering ..."
The South African wound up fifth, half a second adrift of Villeneuve. But the difference in their moods was much greater than that. Fourth on the grid should have been Alan Jones. Should have been. In the last session, the Australian bravely worked his Williams round in 1m 7.99s, but that time - and his entire session - was dismissed by the stewards, who claimed Alan had infringed the yellow flag rule. At the long double-apex right-hander onto the pit straight, Didier Pironi had a very large accident, Jones arriving on the scene shortly afterwards. "They didn't have the flag out at the beginning of the corner, but in the middle. It's flat in fourth there, and once you're into the corner, you're committed. You can't just go lifting off and slamming on your brakes." The stewards claimed that Alan's best time was set on this particular lap, and took it upon themselves to punish him and Hector Rebaque, whom they judged guilty of the same sin. The Friday times had to stand, therefore, and Jones was back to seventh, on the fourth row. Saturday had been a bad day all round, with a stuck master cylinder cooking the front brakes in the morning, team-mate Clay Regazzoni driving over his front wing in pit lane in the afternoon (! ), and, finally, after the Pironi accident, a blown engine. After the torment was finally through, Alan made a few terse observations about Gallic shortcomings, his determination for race day greater than ever. The stewards' decision meant that, remarkably, there was no Cosworth-engined car in the first three rows. Immediately behind Jones, on row five, was Regazzoni, back in the limelight after his fantastic display at Monaco. Fourth and sixth on the grid were the Brabhams of Piquet and Lauda. In that order. Clearly, there is nothing between these two in terms of speed, which is a compliment to Nelson rather than a criticism of Niki. As at Monaco, the Brazilian suffered during the weekend from stomach pains: "There's nothing wrong with me. I'm not ill, just nervous!" All traces apparently disappear as soon as he gets in the race car, and certainly there was nothing half-hearted about his driving. In every session he was faster than Lauda, who complained of severe understeer on Friday, taking the spare for the following day and being much happier for it. The revised sidepods, first seen at Silverstone two weeks ago, have done a lot for the car. Renault 1-2 Ferrari 3-5, Brabham 4-6. Such were the three first rows. If there was much French delight at the pace of the Renaults, there was equal disappointment in the showing of the Ligiers. After such a long absence from competitive Formula One, it was asking a lot of Jacky lckx that he run near the front from the outset, but the great Belgian quickly came to terms with the JS11. Maybe some of his raw speed is gone for ever, but the pure class of his ability remains a joy to watch, with not a single rough or unnecessary action. On Friday, he was virtually as quick as Jacques Laffite, being worried only by the physical effects the G-forces. "The adhesion is simply incredible, nothing less. Considering my lack of experience of ground effect cars, I am happy. I don't think it was a disaster." Nor was it. More disappointed by far was Jacques Laffite, who was unable to equal his testing times, and indeed had to struggle to get near them. For his home Grand Prix, Jacques had a new, revised JS11, with reprofiled sidepods and new front suspension, but he discarded it after the first day, displeased with its turning-in ability. On Saturday he was back in his usual car: "It's better than the new one, but still not good. We have these new Goodyears, which are very slightly taller, I think, and the car just does not work so well. Eighth on the grid, Laffite was a very disappointed man. Ickx, who did not improve on Saturday, qualified 14th. The animals went in two by two ... This remarkable phenomenon - which certainly substantiates the argument that chassis are more important than drivers - continued all down the grid. Tenth and 11th were the Tyrrells, and 12th and 13th were the Lotuses. For Ken's team, it was another very expensive weekend. After his series of accidents at Monaco, Didier Pironi had a new 009 chassis for the weekend, but it had a very short working life. Through the very fast corner before the pit straight, Pironi flew off the road when the left rear wheel parted company with the car. The Tyrrell flattened the three rows of catch fencing before hitting the barrier very hard indeed ... the front bulkhead and part of the monocoque were completely torn away, yet Didier's legs - and the rest of him - somehow escaped injury. To see the car afterwards was to doubt that, but, sure enough, there was the man himself hopping into the spare car. In the course of his short time in Formula One, Pironi has had quite a remarkable number of accidents, the great majority of which he has not brought about, and one inevitably begins to wonder how long it will be before he is psychologically affected. Practice was stopped for an hour after the shunt, while the catch fencing and barriers were repaired. Not surprisingly, Pironi did not improve his time with the spare car, but a very neat and precise Jarier found more than half a second to move up past his team-mate. "It's just very unbalanced through the quick corners, and we can't find a way to solve it at present." Mario Andretti was speaking about his Lotus 80, which stubbornly maintained its refusal to behave like a Lotus. The World Champion had two cars from which to choose, the original one (with rear wing proper) and the second car, seen at Silverstone. This one has reprofiled sidepods and low-line rear-wing, but Mario was very unhappy with it on Friday, and concentrated on the earlier car for the final session. "It's fine through slow and medium-speed corners, which is why it wasn't too far from the pace at Jarama and Zolder," he said, "but through the quick ones, there's no way at present." Was he troubled by the G-forces? "The way the car is at the moment, I wouldn't know about that," he grinned. "I tell you. I'd be mighty happy to be worried about G-forces ..."
Carlos Reutemann was a hundredth of a second slower than Andretti, and, as ever, was in a 79 - which he seems in no hurry to trade in! Lole, too, complained of a lack of grip, and had to spend part of his time in the spare car. In both Friday sessions, the race car was halted with a faulty master switch. Still, at least the 79 was still in the original dark green, rather than the replacement khaki of the 80. It was another bad weekend for Lotus, and, with several quick circuits coming up on the calendar, their immediate prospects are less than rosy. All being well, the French Grand Prix will have been John Watson's last in a McLaren M28, be it B, C or whatever, and he will not lament its passing. The M29 should be ready for Silverstone, and, it is to be hoped. will move John away from the depressing end of the grid. Practice was uneventful, but he worked his way down to lm 9.97s, substantially quicker than he managed during testing after Monaco. Patrick Tambay, his M28 now, to exactly the same specification as Watson's was almost a second slower, but relieved simply to be in a race, after failing to qualify at Zolder and Monaco. Next to Watson, on row eight, we find the Wolf WR8, now with a happy face behind the wheel, for Keke Rosberg has unbounded enthusiasm for his new job. In the end, he was disappointed with his grid position, and was robbed of an opportunity to improve his time when the engine went dead towards the end of the last session, immediately after his last set of qualifiers had been fitted. After missing Monaco, Bruno Giacomelli and the Alfa Romeo Totale were back. Inevitably, the Italian suffered from not having a ground effects car, but the Alfa ran reliably enough - after some problems with its injection system - and Bruno found the handling better than before, thanks to a 12cm spacer between engine and gearbox. Alongside him, 18th, was Emerson Fittipaldi's venerable Copersucar F5A, which had enlarged 'flick-up' tabs at the rear of the sidepods. Emerson hopes that the redesigned F6 will be ready for the British Grand Prix. Two by two again, although it must be remembered that virtually no testing has been done. What curious looking devices they are - almost like conventional Grand Prix cars which have ignored a 'Warning Low Bridge' sign. Both cars were troubled by overheating problems in practice, and Patrese and Mass clearly had to work very hard through the corners to counteract the understeer. With a more reclined driving position than is usual these days, Patrese said he found the physical strain much harder than with the older cars. So de Angelis got a race after all, startinq from the last row with Hector Rebaque's Lotus 79, which should have been quicker. Even so, every one of the 24 starters was under Andretti's pole time of 1977. Arturo Merzario's spasmodic laps with his own car never looked like producing a worthwhile lap, but Patrick Gaillard's efforts in the Ensign were heroic. The car was down to be driven by Tiff Needell, of course, but Mo Nunn was disappointed to find that the Englishman did not meet the requirements for a 'super-licence', which would seem to indicate that the requirements need looking into, for Gaillard's experience is hardly the equal of Needell's. No one wants to see 'Gimax' back in an Fl practice session, but must qualifications be based on the record book alone? For all that, Gaillard did a very good job, and Nunn was very impressed with his ability to describe what the car was doing. The crowd on Sunday was predictably of epic proportions, variously estimated at between 100,000 and 120,000. Whatever, it was big, no doubt swelled by the news of the practice times. The fans had presumably gone into Grand Prix week expecting to cheer for the blue of Ligier; now they were here in droves to lend their support to the yellow of Renault. A nationalised Formula One team. Whatever next? Even the Gods seemed to be on the side of Gerard Larrouse and Jean Sage. doing their bit for the home side. After the blistering, if clouded, heat of Friday and Saturday, race day was overcast and cool - in other words, perfect turbo weather. All the omens seemed to be pointing in one direction. Jody Scheckter's mood did not improve with the Sunday morning warm-up. To add to his general dissatisfaction with his Ferrari's handling, he now complained of his engine. Eleven-eight was all it could muster, rather than the usual twelve-two. It was not, however, changed for a fresh one. On the Renault and Ferrari stopwatches, Jody set the fifth best time in the half-hour, behind Jabouille, Jones, Villeneuve and Arnoux. Not only the Renault team was pleased with the change in weather, for all the drivers were relieved. Eighty laps of Dijon was going to be a long, long way, and any assistance was gratefully accepted. Overnight, both the Renaults had been fitted with neck supports, and Jabouille just hoped that his recent exercises (to build up his neck muscles) had been enough. Jacky Ickx, of course, had used a neck support in his Ligier the day before, and was more aware than most of the test that lay ahead. Nonetheless, his Ligier debut got away to a disastrous start when he found second rather than fourth on his warm-up lap, the blue car going off the road and into the barrier. Damage was slight, but there was no time for repairs. Quickly, he hitched a ride back to the pits on the back of a motorcycle, whereupon he was strapped into the spare JS11, which he had not driven before. "For me, it is very important to get a good start," said Gilles Villeneuve on Sunday morning. "Somehow I must at least split the Renaults on the first lap." He did better than that. When the green light blinked. the Ferrari lit up its tyres and catapulted away. Arnoux, on the front row, very nearly stalled his car, and that was all the gap Gilles needed. Jabouille had got away reasonably well, but it was not enough to hold the Ferrari. Villeneuve led the pack into the first corner, intent on forcing the issue from the outset. All the way round that lap, the Ferrari was on the ragged edge, but the policy was working out. Gilles was leaving them behind. As the T4 bellowed past at the end of lap one, it was followed by Jabouille, Scheckter, Piquet, Jarier (a sensational start from row five), Lauda, Laffite, Jones and - back in ninth spot - Arnoux. After two laps, Villeneuve's lead was over two seconds and growing, but Arnoux was already giving notice of the Renault's potential, dispensing with Jones and Laffite in a single lap. After another, he was past Lauda. The little Frenchman has a very staunch following at home, and his fans were delighted to see their faith vindicated. Anyone who has seen Arnoux in a Formula 2 car through the downhill swerves of Rouen was not surprised with his showing; others, whose interest in racing is based primarily on currency exchange rates and social pages, wondered who the hell he was. Outside of a racing car, Rene is a quiet and shy individual, whose Formula One drive has come out entirely because of ability rather than smooth manners. In the cockpit, he is gritty, tough and determined, well able to take care of himself. And we were seeing it now, as he calmly outbraked his peers at the end of the pit straight, lap after lap. We would see a great more later as Arnoux repaired his startline mistake, however, his team leader seemed disinclined to worry about the steadily disappearing Ferrari in the lead. At five laps, Villeneuve was more than four seconds to the good, with Jabouille steadily dropping Scheckter. Piquet ran fourth, with Jarier fifth, but the Tyrrell was swiftly passed by Arnoux, who needed only another five laps to displace the Brabham. Behind them, after ten laps, ran Jones, Lauda, Laffite, Regazzoni, Pironi and Andretti. 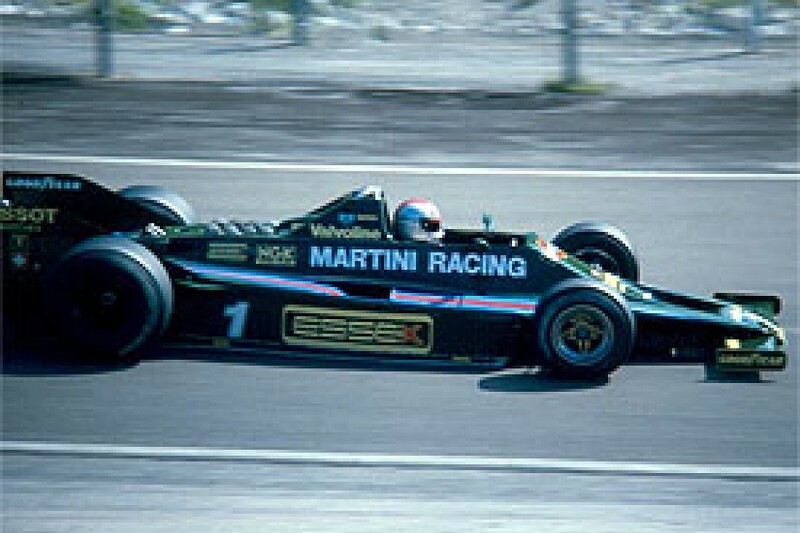 Mario and the Lotus 80 were already in trouble with poor handling and insufficient braking. On lap 11, he came in for the first of three stops, rejoining some minutes later at the tail of the field. At the front, Villeneuve's progress was remarkable, but one wondered if he might regret the early charge when tyre wear became critical in the second half of the race. "I am not interested in three or four points," he had said on Sunday morning. "This is one I want to win, nothing less. I need those points to close on Jody and Jacques. If Jabouille once gets into the lead, I think it will be impossible to catch him." Although maintaining his five-second lead, it was clear that Villeneuve's Ferrari was making its driver work. The Renault, by contrast, looked as smooth as silk. If Jabouille was content to let Villeneuve lead, Arnoux clearly had very definite ideas about coming to grips with Scheckter, and the South African surrendered without a fight on lap 14. Ferrari, Renault, Renault, Ferrari. The four Michelin cars held sway. Behind them, Alan Jones was starting to come to grips with Piquet's Brabham, but Nelson was driving superbly, making no mistakes and coping with steadily worsening oversteer. 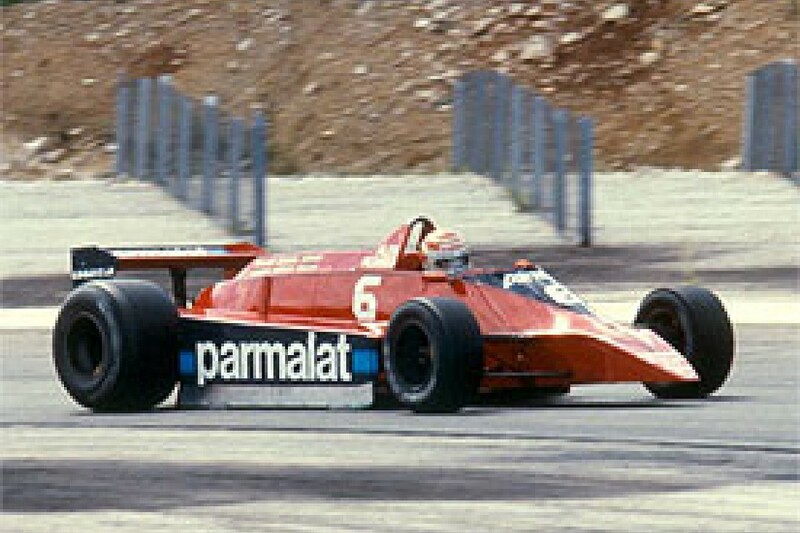 Lauda's similar car, by contrast, was slipping down the field, yielding to Jarier and Regazzoni. On lap 24 it disappeared from the lap-charts altogether, Niki having spun at the ultra-quick right-hander before the pits. The car was undamaged but its Alfa V12 was dead, and Lauda was unable to restart it. Quite suddenly it became obvious that Villeneuve's strategy, while the only one open to him, was not going to work out after all, for Jabouille was closing relentlessly, sometimes by as much as half a second a lap. 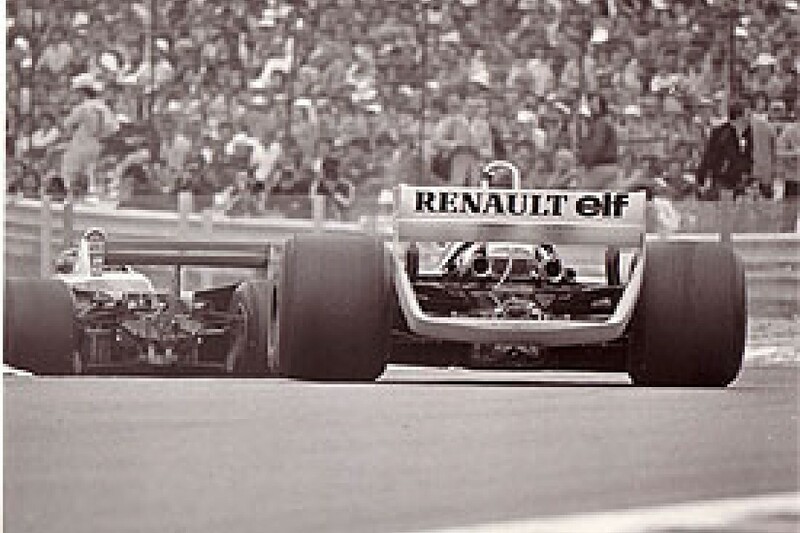 The two of them were now well clear of the rest, who were led comfortably by Arnoux. Scheckter ran a consistent, if rather uninspiring, fourth, followed by the Piquet-Jones battle. Jarier was working his Tyrrell really hard, with Regazzoni closing in, and behind Clay, Laffite struggled on with the Ligier. The temptation to dip the clutch must have been strong for Jacques, embarrassingly off the pace in front of his adoring fans, but he never gives less than his best, and would not do so now. Jacky lckx was having an awful time in the spare Ligier, which was not set up for the circuit and, more important probably, lacked his all-important neck-support. After only 18 laps he had been in for new front tyres, returning three laps later for some fresh rears! It was an unhappy race for the Belgian, and ended finally with a blown engine. 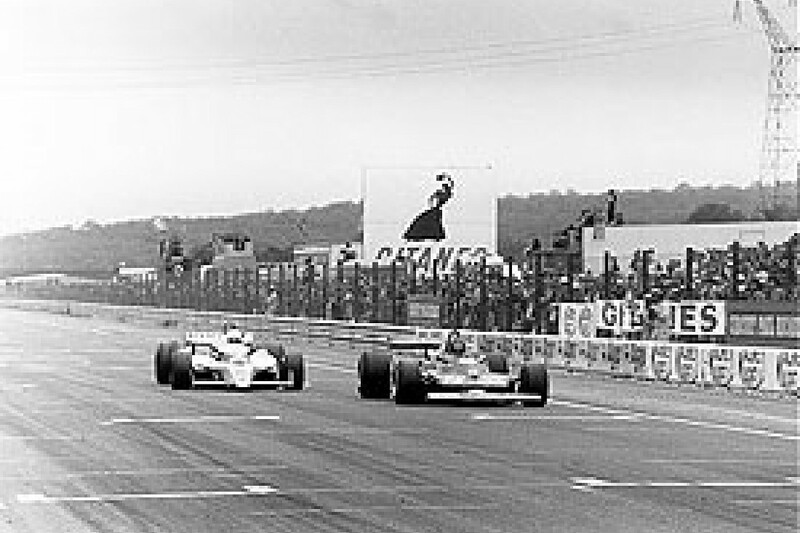 But Jabouille was right up with Villeneuve after 30 laps, and the spectators really began to believe that perhaps a French victory might be at hand. Villeneuve was not about to wave Jabouille by, however, and a combination of lucky breaks with lapped traffic, handled with good deal of verve, pulled the Ferrari's lead out to four seconds again. It was good for Maranello that Gilles was striving, for Scheckter had fallen back into the clutches of Piquet and Jones, both of whom passed Jody on successive laps. The South African's dilemma was difficult to understand, for he had started on the same tyres as his team-mate, and the car looked to be handling well enough. Nearly every Grand Prix driver has an occasional weekend when things do not come together, of course, and for Jody this looked like one of them. "For the second half of the race, my car was all over the place," said Villeneuve later, this being the price of his early charge. On right-handers, he added, it was oversteering, and on left turns, the very opposite. So when Jabouille moved in once more, Gilles had no worthwhile cards left to play. On lap 46, Jean-Pierre made his move, diving past the Ferrari at the end of the pit straight. "I remember being told early in my career that it was essential, after overtaking, to go as quick as possible for three or four laps afterwards," he said afterwards. "It demoralises the guy behind. That was good advice. and I really went hard for a while." In five laps the Renault went three seconds clear. Just once, as Jabouille accelerated up towards the hairpin, the turbo V6 hiccoughed a little, but next time around it was sweet again. Now the driver had only to keep going, keep praying that this time it would all come right. At the end of the 54th lap, a disconsolate Scheckter came down pit lane, and the mechanics - all the mechanics, it seemed! - set about changing all four wheels. Jarier, Regazzoni and Laffite had all gone by when Jody went back out, and it now looked unlikely that he would take any championship points from the afternoon. Within half a dozen laps he caught and passed the hapless Laffite, but thereafter the Ferrari ran seventh for the rest of the day. The truly appalling fortunes of the Brabham team - one point from two cars in eight races - took a further dive when Piquet went off the road at the right-hander before the pits. For many laps Nelson's car had been oversteering wildly through the turn, and this time he simply failed to catch it in time, a fact he frankly admitted later. He was probably too modest. Bearing in mind the pressure he was under from Jones, it was merely amazing that he had kept it on the road as long as he had. The car went through the catch fencing and into the barrier, but there was no hurt to the driver. Stalemate appeared to sum up the dying laps. Jabouille was a quarter of a minute to the good, with Villeneuve similarly ahead of Arnoux. Jones ran a solid, now lonely fourth, and Jarier appeared to have the measure of Regazzoni. 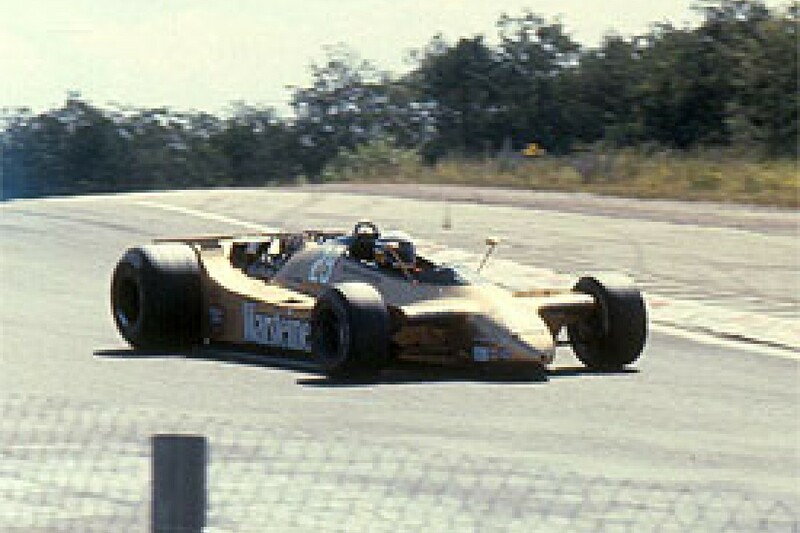 In fact, keeping a lap chart remained hectic to the end, for the race track was uncommonly crowded, there being very few retirements, Andretti had gone, finally, after using much of the afternoon as a test session far the recalcitrant Lotus 80, his chances ruined earlier by the braking problem. But Reutemann was still running, vaguely in touch with Rosberg's Wolf, which had passed him earlier. Watson's McLaren and Emerson's Fittipaldi had run in company for much of the race, but that came to an end when John pitted for new tyres. Fittipaldi later went out with a blown engine. Pironi, after a drive understandably less spirited than usual, retired late in the day with rear suspension problems. Otherwise, they were all out there. And now it was that the race came alive. 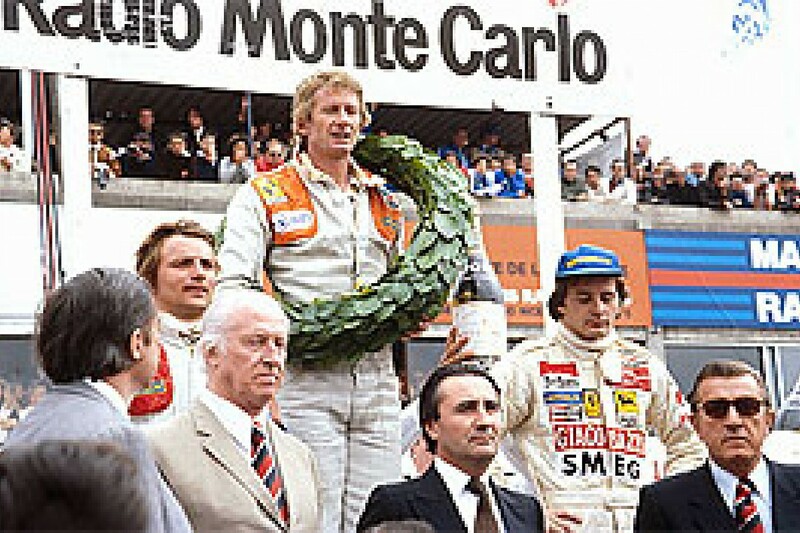 The question of victory was never in doubt, of course, for Jabouille had all well in hand. But even he was not without problems. "In the last 30 laps, my brake pedal went 'hard', and required a tremendous effort to push it. For the last few laps, I was in a lot of pain with my right leg, and I don't believe I could have continued for much longer." 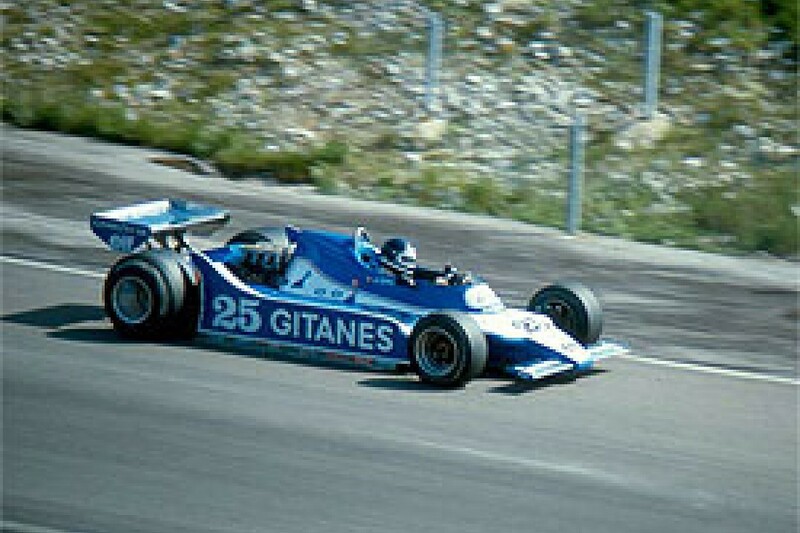 Jean-Pierre's problems, however, were as nothing compared with those confronting Villeneuve, whose tyres were now quickly approaching the end of their life's work. The Ferrari's pace had slowed appreciably; and at the same time, Rene Arnoux, fighter that he is was responding to pit signal and giving the Renault everything he had, closing in on Villeneuve at a simply prodigious rate, something around a second and a half a lap. With ten laps left, Gilles's position appeared hopeless, for Arnoux was only five seconds back and, as we had seen earlier in the race, quite obviously has no trouble in passing people. Five laps to go, and the two cars were almost nose, to-tail, spectators now on their feet, willing Arnoux on screaming frenzied support. 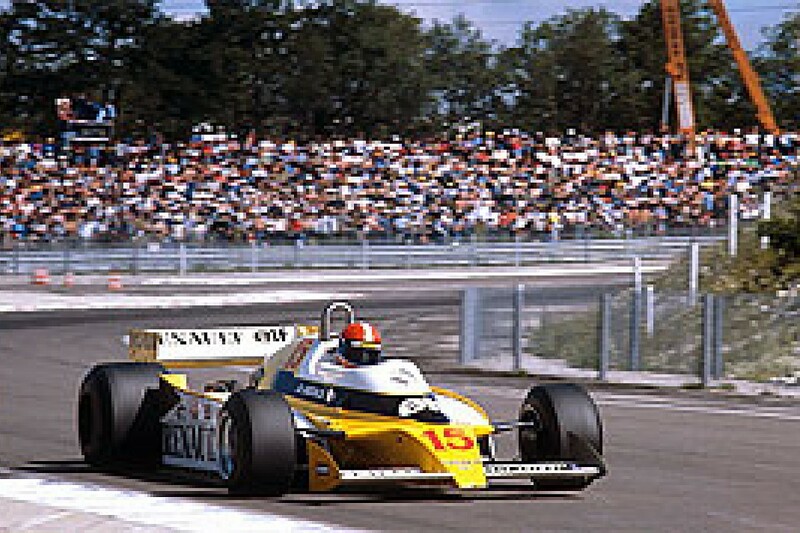 Villeneuve surely could not withstand the Renault for long, for Arnoux was now quite inspired, swept along by the moment. On lap 71 he had gone round in 1m 9.16, more than a second faster than any other driver in the race! And some measure of Villeneuve's determination is that he, too, set his fastest lap of the race at the same time, hobbled by tyre wear or no. On lap 77, Jabouille went through, then a horde of backmarkers, then ... delirium from the stands, Arnoux was in front! It was going to be a Renault one-two. At the end of the pit straight, he had calmly out-braked Villeneuve and snatched second place. And that, said we, was that. Gilles had gallantly carried the battle to the Renaults. and the gamble had failed. Torque - and a healthy dose of French pride - had beaten him. But Villeneuve is not like that. He had sensed that something was slightly amiss with Amoux's car. "When Rene passed me, I expected him to run away down the straight, just as Jabouille had done, but the gap stayed the same. I couldn't close on him, but he wasn't getting away." Arnoux's fuel pick-up was faltering slightly in the last few minutes. "I thought I would try to get him back as quick as possible, because he wouldn't expect it. At the end of the pit straight, I wasn't really close enough, but I dove for the inside and left my braking really, really late ..."
With smoke from all four tyres, the Ferrari scrabbled inside the Renault, and the two cars rounded the tight right-hander side by side. Neither driver has any real idea of the remaining four or five miles, how many times they banged wheels, slid wide, went off the mad, rejoined it, touched again. It was desperate in a manner we have not seen in Grand Prix racing for a great many years. The downhill left-hander into the loop is not a place for overtaking, nor even for lapping unless the back marker is unusually charitable. It follows a top gear right-hander, which dictates line astern formation Therefore, it was with considerable surprise that we witnessed the Ferrari and the Renault emerge absolutely side by side on the last lap. 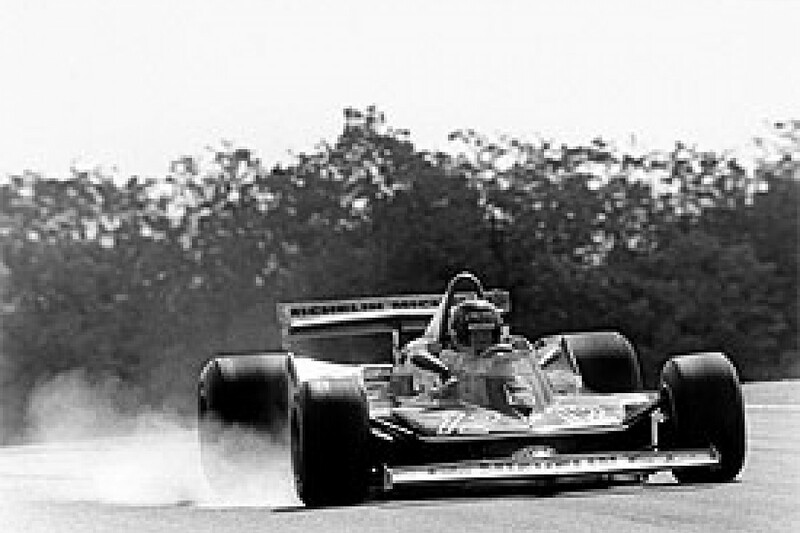 Down through the left they plunged, Arnoux sliding out into Villeneuve, both cars getting way out of line on the exit. Rene led up to the hairpin, but Gilles asked one more favour from his exhausted Michelins, braked later than late, and snatched back the place. Desperately Arnoux tried another counter-attack, but Villeneuve was not giving way now. Across the line they went, the Ferrari in front. There was total pandemonium. Almost unnoticed sadly, was Jabouille's victory lap. He had driven magnificently, taken just reward from many years of toil but the crowd had seen only the two behind him. As they cruised round the slowing down lap, Gilles and Rene saluted each other, and when they stopped, there was a shaking of hands. It had been good and fan, any there were no recriminations from either man. "No," grinned Arnoux, "I am not sad to be third. I enjoyed the race very much, and Gilles drove a fantastic race. Mast of all, I am pleased for Jean-Pierre. C'est justice!" When Jabouille pulled up, the full import of his victory began to sink in with the crowds, and they yelled themselves hoarse. But Jean-Pierre, totally exhausted and in pain from his leg, was in no position to savour it just yet. For endless seconds, he remained in the cockpit, immobile, while others unbuckled his helmet and belts, and helped him from the car. Finally, like a man in a trance, he looked around him, and began to smile It had all been worth it. The same could not be said of his tyres. In the midst of the French delight, Reutemann's Lotus arrived back in the paddock, its nose and front suspension damaged after Carlos ran out of brakes and hit Rosberg. It was another of those incidents which got lost in the battle for second place. So we had a race of novelty, a first win for Renault and their turbo and Jean-Pierre Jabouille, an extra-ordinary scrap for second place, continuing success for Michelin, the emergence of Rene Arnoux. And think on this: we also had a race - a Grand Prix - without a single English driver. Come to think of it, the season is past halfway, and we have yet to see a British victory. M. Guiter and his company are now seeing the fruits of their policy.